Apart from limited budget, the major reason on why I bought ‘Don Quixote’ was because I would like to try reading what it is called as a literary masterpiece that shapes the Western literature, the book that inspires so many great writers. Even John Steinbeck names his camper in his travelogue ‘Travels with Charley: In Search of America’ as Rocinante, the name of the protagonist’s horse in ‘Don Quixote’. The other reason was feeding my ambitious goal of completing what would have been the thickest novel I would have ever read in my whole life; around 1,000 pages in some book versions. As I would have expected, the result of this reading experience was disastrous. I knew that this trial would turn out to be that miserable yet I kept reading the book until I eventually confirmed that my initial estimation was indeed correct. It isn’t about the language. The novel’s language is simple, far from being complicated as I always read in Victorian novels so far. It is, in fact, straight-forward, not many implicit sentences. 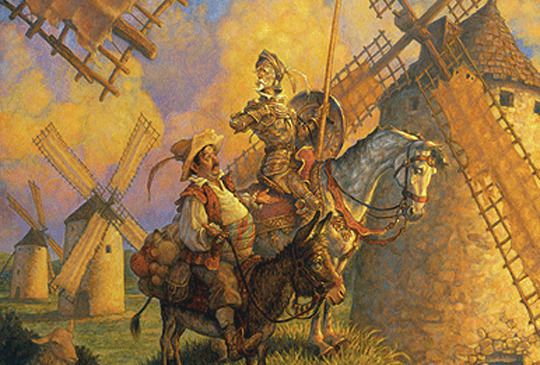 By the way, the book, whose complete title is ‘The Ingenious Gentleman Don Quixote of La Mancha’ is originally written in Spanish by Miguel de Cervantes Saavedra, published in 1605 and 1615. The one that I read is the English-translated one since I don’t know about Spanish language at all. It isn’t about the content, too. In fact, this should have been my favorite because it is so hillarious. The novel tells us about the adventures of Alonso Quixano, a man turning 50 years old. He decides to set up journeys with his horse and a farmer, Sancho Panza, under the name of Don Quixote after reading so many books about chivalry and romance as well. His mind is so occupied with the stories in those books that he creates his own kind of trips resemble to those in the books while acting like a knight in shining armors desperately wanting to rescue her love life, Dulcinea del Toboso, whose real name is Aldonza Lorenzo, his actual neighboring farm girl, who does not know anything about this, as a matter of fact. On the surface, I laughed reading so many parts of the first pages of the books. I found everything that Quixote did was stupid, silly yet funny. But deep inside, I felt so sorry for him. Encountering a middle-aged man who was supposed to spend time with his family but Quixote, instead, launched a so-called literary fake journey to feed his absurdity. When his actions were met with people’ weird eyes, some of them finally ended up in fatal fights, I found the novel was desolate. Whenever I read this book I perceived like I was watching a dark comedy movie starring Adam Sandler. I felt like I was entertained in such joyful yet pathetic way at the same time. So, it’s not about the language, the topic that causes me to put it down in just after, may be around 100 pages out of the total 1,000 pages, so what are the reasons then? The reason was as a simple but as very subjective as the feeling. I wasn’t moved by the story. I failed to have my emotion stirred while reading the novel. All I could recall from the unfinished reading experience was that I got the core of the story (at least until one tenth of the whole volume), I sensed the atmosphere, I fancied the characters and events, I got the author’s writing purposes. To declare that I was completely into the book, those outcomes were insufficient. To sum it all, I didn’t enjoy reading the novel. The cause was I disliked the writing type. Too straight, the kind of tell-not-the-show writing method. This is the type of writing that always fails to stimulate my imagination, emotion, thus, finally, fails to draw me into the novel, make me feel as part of it. The second cause was that there are too many events within just several pages that put my brain, let alone my heart, like in a car race. I couldn’t savor the art of the novel if I put my reading speed at its fullest. I was gasping for breath. My emotion did not go hand in hand with my brain. I always feel guilty whenever I have to abandon this kind treasure but I can’t forcing myself to read something that does not suit my heart. Each time I find the novel remains untouched after so many months (again) I feel a bit overwhelmed. I should never again consider people’ judgement as a major factor that causes me to buy a book, not even Nobel Prize in Literature, Man Booker Prize Award, or Pulitzer Award. Making them as a recommended factor is fine but personal taste always comes first. If you find a book which doesn’t touch your heart once you read the first sentences, better leave them away. Else, you will end up regretting your choice and feeling guilty looking at wonderful titles remain unread after so many months, years. Whether or not your reading choice is widely considered as shallow, have no class at all, stick to your option always. Because, reading novels has to bring pleasure for you, if not, then may be what you read is obligatory. And that is no fun at all. So, ‘Don Quixote’, may be, just may be if I ever change my reading taste, will I come back at you, again, and again?